Summer Wishlist: For Beach or Travel! 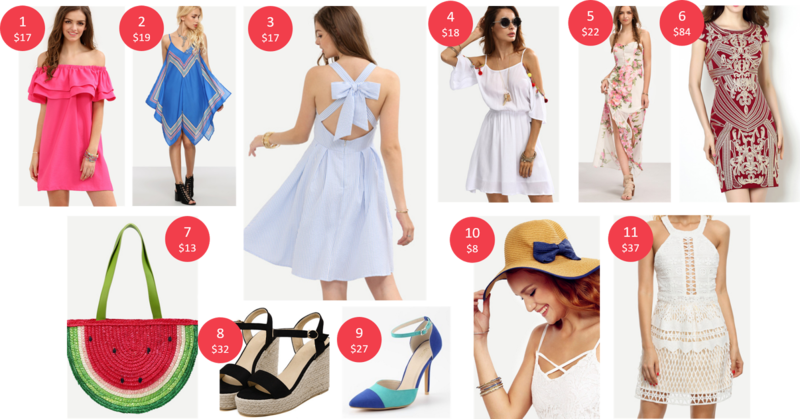 Summer is finally in the air, and I don’t know about you, but I’ve got dresses, hats, bags and shoes on the mind! These are at the tippy top of my summer must-have list, for obvious reasons. Take a browse and see what catches your eye – plus, the price is right with these pieces! I’m in swoon city over this striped bow back dress! It’s a steal at $17, since you can easily wear it to the beach or dress it up for a night out! I can’t wait until this one’s at my doorstep! There was never a cuter summer bag than this $13 watermelon dream! This fun dress is not only neon pink, but it has ruffles AND it’s off-the-shoulder? So on trend, count me in! Straw hats are trending, not to mention they protect the top of your head from getting burnt at the beach! This one is less than $8 and has a bow on it so it’s automatically ten times cuter than other hats out there! Hope you liked these pieces and that they inspire you to treat yourself this summer! Comment Challenge: Which of these pieces would you love to add to your summer wardrobe?